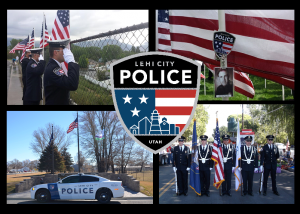 The Police Department will provide a safe and secure community by delivering professional and courteous services as determined in partnership with Lehi residents. The Police Department’s function is to serve and protect all people and property within the City limits. This is done through the coordinated efforts of patrol officers, detectives, code enforcement officers, and animal control officers. This report is intended to provide general information about the Police Department organization, operational changes, tactical changes, and statistical information from the 2015 calendar year. This incident occurred within the Lehi City jurisdiction. This did not occur on a state highway. You can enter a cell phone number in case an officer needs to contact you for additional information. If you answered YES to all of the above questions, you are ready to file your report online. If you answered NO to any of the questions, please call dispatch at (801) 794-3970 to report a crime. IMPORTANT: You must put a phone number in case an officer needs to contact you for additional information. Follow up contact will NOT be made to an email address. All cases filed using the Citizen Online Police Reporting System will be reviewed.